India Tablet PC market shipments reached 1.90 million units in CY H2’2013, representing a decline of 14% over CY H2’2012. SAMSUNG remained as the market leader in the Indian tablet PC market followed by MICROMAX and LENOVO. India’s tablet PC market for the first time recorded a decline in the unit shipments, primarily due to factors such as introduction of BIS guidelines, low profitability at entry level segment and shift of players focus towards enterprise segment of the market. Further, the India tablet PC market also witnessed exit of few players, which resulted into further decline of the market. Another major factor responsible for the downturn of the market is the growing demand for phablets amongst Indian consumers. Growing popularity and declining prices of phablets is impacting the demand for tablet PCs. However, market expects a growth over the coming quarters, wherein, major demand would be coming from enterprise segment and verticals such as retail, education, and BFSI. 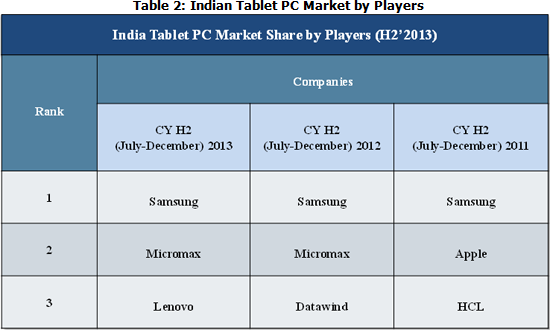 India’s tablet PC market is highly competitive. A cut throat competition exists amongst the leading players. Samsung still leads the Indian market; however, regular shuffling of players for number two and three position is emerging as a new trend in the industry. Over the coming quarters, Android based tablets would continue to lead, but their growth might decline due to growing acceptance of Windows OS and increasing sales of Apple iPad.